Crawl spaces are often left ignored as many homeowners do not realize the importance of crawl space maintenance. Crawl space encapsulation is an easy and permanent way to keep it clean and maintained. At Stable Foundations, our experts can encapsulate your crawl space to give you peace of mind and less worry about the condition of your crawl space. Crawl space encapsulation is one of the best ways to maintain a healthy crawl space with very low maintenance for you as a homeowner. 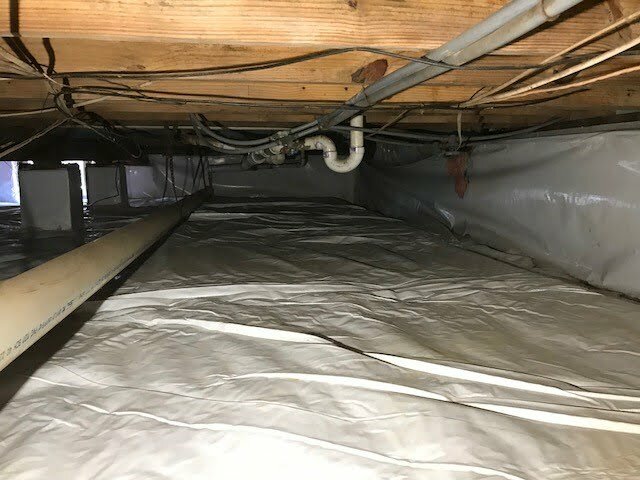 Once your crawl space is encapsulated, you no longer have to worry about potential water or structural damage to your home. Crawl spaces are susceptible to damage based on their design. Their lack of air flow and their dark, damp space can create a colossal of problems that no homeowner wants to deal with. Crawl space encapsulation is a quick and easy way to avoid these problems from occurring. It creates a dry, healthy environment that helps you avoid unwanted issues. Owning a home has enough responsibilities. Maintaining your crawl space doesn’t have to be one of them, and encapsulation is an easy way to keep your crawl space maintained without the work. It keeps your crawl space clean and dry so don’t have to worry about it. Encapsulating your crawl space is one of the best investments you can do for your home. Our team is happy to come out and provide a free inspection of your crawl space. To properly encapsulate a crawl space, there are necessary steps that must be taken. Our installation experts have perfected this process over the last 25 years to provide the best possible results. We start by removing the existing floor insulation under the sub flooring inside the home's crawl space. We remove any old existing building materials, trash, old plastic, & level the crawl space floor. We eliminate any mold and termite nests with our mold abatement and pesticide spray. We insulate the crawl space walls, vents, & rim joists with Greenguard R10 2” foam board around the perimeter. We also seal any foreseen voids with foam spray sealing your crawl space tight. After the crawl space area is insulated, we wrap the crawl space floor, piers, & walls with a 16mil vapor barrier. We use the strongest vapor barrier on the market. Standard building code calls for 6mil and we use 16mil. Depending on your home’s ventilation we either supply positive air supply with a 4” x10” duct boot off your HVAC system or install an Aprilaire dehumidifier system with condensation pump. We can even install a digital control for the Aprilaire unit so you can adjust the unit anytime you would like. Relax, Stable Foundations has encapsulated your crawl space to ensure it's clean, with no more wood rot, mold growth, or pests living under your home. At Stable Foundations, we use ultra-liner products made in the USA combined with superior Aprilaire dehumidifiers. Our team works quickly so your crawl space can be encapsulated in as little as 3-5 days. The combination of our detailed process and our high-quality products ensures that your crawl space will be permanently protected. Many homeowners have trusted us with their crawl space encapsulation throughout Virginia for over 25 years. For three generations, our family-owned company has refined and perfected our processes to provide the best possible solutions for our customers. Contact Stable Foundations for all your crawl space encapsulation needs. Contact us today to schedule your free inspection!